Why did the Byzantines mutilate so much? Reader Karen asked why the emperors seemed so fond of mutilation. Believe it or not this was actually seen as a more humane practice of dealing with potential usurpers than the standard treatment of execution. By longstanding tradition only someone of unblemished physical appearance was fit to rule, so a little mutilation (usually blinding, cutting off the nose or splitting the tongue) was an easy way to remove a threat without killing anyone. 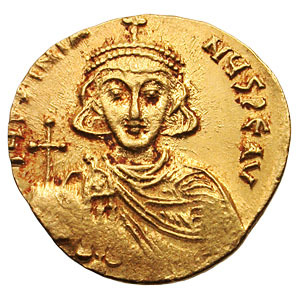 This held true till the reign of the monstrous Justinian II who was deposed in 695 and sent into exile without his nose. The resourceful man had a gold replacement made and managed to storm Constantinople, taking terrible vengeance on the usurpers. He was given the nickname “Rinotmetos” (the Slit-nosed) and since mutilation obviously hadn’t kept him from the throne, it thankfully fell out of favor. The practice wasn’t completely abandoned, however. Deposed rulers were still occasionally blinded and some emperors- Basil the Bulgar-Slayer comes to mind- mutilated on a mass scale as a way of intimidating their enemies.